Our Alpinia purpurata with its gorgeous red bracts, sometimes measuring cm in height and commonly known as the Jungle King is different from the Jungle Queen with its pink bracts. They were grown at a strategic place in our garden to be the distinctive accent. Definitely the attention-grabber for about 4 years, beautifying and brightening our front yard with seemingly endless blooms throughout the years. Majestically, they radiate so much joy with their striking red bracts amongst their healthy and shiny green foliage! The Red Ginger is the national flower of Samoa, and is locally called Teuila. Botanical Name: Alpine purpurata (Vieill.) K.Schum [syn. : Guillainia purpurata Vieill]. Common Name: Red Ginger, Red Cone Ginger, Jungle King, Ostrich Plume. Etymology: The genus Alpinia t is named after Prospero Alpini, a 17th-century Italian botanist who specialized in exotic plants. The species epitaph purpurata means purple in reference to the bracts. Origin: Native to Malaysia and Papua New Guinea in Tropical Asia, and New Caledonia, Solomon Island and Vanuatu in Southwestern Pacific. It is widely cultivated elsewhere in the Tropics. Plant type: Tropical perennial, herbaceous and ornamental shrub. Features: Alpine purpurata is a popular species of the genus, Alpinia that comprises about 230 species of flowering plants. It has a medium growth rate, upright growing and reaching between 1,8-3 m in height and spread indefinitely from its aromatic rhizomatous roots. The bright to medium green, glabrous leaves are evergreen and arranged alternately along the cane-like stems. The leaves with entire margin are oblong-shaped with a pointed apex, measuring 30-80 cm long and 10-20 cm wide, and resemble miniature versions of banana leaves. A free-flowering plant that produces a 15-30 cm long, terminal inflorescence spike with showy red coloured overlapping bracts. The panicles may later droop as they elongate. The true flowers are small and white, and nearly encased in the bracts. One of the popular cultivars of Alpinia purpurata is the Jungle Queen that produces pink flowers. The flowers will be followed by dehiscent dry fruits containing black and waxy seeds. 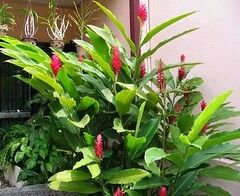 Culture (Care): Alpinia pupurata is easy-growing with least maintenance. Light: Prefers semi-shade to full morning sun. Moisture: Moderate to high water needs. It is not drought tolerant and benefits from humid conditions. Soil: Not choosy but grows best in well-drained, fertile and loamy soils. Others: Remove spent flower heads and yellow or withered foliage. Feed once monthly with a balanced liquid fertiliser for flowering or organic fertiliser pellets to promote blooms. No known serious insect or disease problems though prone to chewing and sucking insects. For subtropical and temperate regions: Hardiness: USDA Zone 9b-11. It is suitable to be planted in tropical and subtropical regions. It will tolerate light brief frost, but can get damaged if the cold persists. It blooms well if provided with sufficient sunlight..
Propagation: By division and aerial plantlets that are produced at the base of the withering panicle of the red bracts. 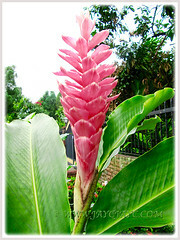 Usage: Alpinia pupurata, an exotic plant with its captivating flowers can be grown as an ornamental shrub in home gardens, parks and public gardensUsed in landscaping, this plant serves well as a decorative specimen. 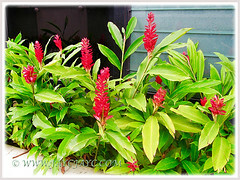 There are Dwarf Red Ginger that grows to 1 m tall that are ideal for container gardening or raised planters. Fresh cut flowers can be used in floral arrangements as they are long-lasting. Attractive to butterflies and bees. It is also used in folklore and herbal medicine to treat illnesses. Read more about the benefits of Red Ginger here. We will never forget this lovely plant even though it had ceased to adorn our front yard garden. Though sad without its physical presence, yet happy that we can still reminisce and enjoy its beauty on our computer and photo albums. Ricinus communis (Castorbean): beautiful & useful but deadly! Christmas cactus? Phoon, do you mean the Red Ginger as seen in the photos above? Well, you can find them sold in most of the garden nurseries around KL and along the Sungai Buloh Road. Anyway, I haven’t visited Sungai Buloh nurseries for quite sometime but someone told me recently that many of them have relocated to Tropicana. All the best in your search though. Received a outstanding floral arrangements; there are few spikes of this red ginger within it. Can I take one of the stalks and propgate into my own plant, and if so how? I don’t think that is possible, Crissl. 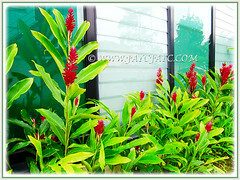 Red Ginger is usually propagated by division of its rhizomes or offsets, and even plantlets that grow at the base of the red spikes can be pruned and thrust into soil to form new plants. 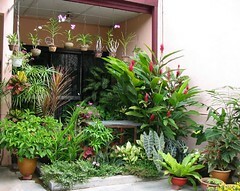 Hi, just wondering if the red ginger lily can grow in pots and still look as nice? Thanks ? Hi Rafy… you can grow them in large tubs as they need much space for the new plants that emerge from the rhizomes. Nevertheless, if you can acquire the dwarf variety of this beauty, you can pot them to look just as gorgeous.